Shoulder joint pain is an ever-increasing problem among people of all ages, and the causes are as varied as the complaints. 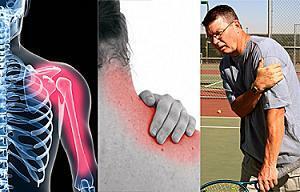 Problems in the shoulder can arise from such things as sporting injuries, work-related injuries, overuse, osteoarthritis, tendonitis and other causes too numerous to count. We’ll devote some reasonable attention to the shoulder, mainly because these conditions and injuries are being seen more and more frequently, and they can result in considerable lost time at work, sporting activities and can even negatively affect activities of daily living. 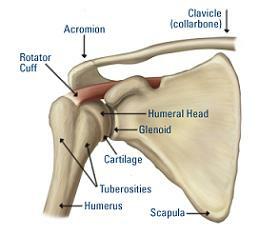 In the ensuing pages, we’ll discuss and describe the anatomy of the shoulder . It is rather different from most joints that you think of, mainly because of how its stability is maintained and multitude of functions the shoulder can perform. Examples of just how prevalent shoulder conditions and injuries are becoming; national statistics show that almost three fourths (75%) of all surgeries performed on the shoulder are for torn rotator cuff problems. Additionally, over 250,000 rotator cuff repairs are performed annually in the U.S.
Basically, the shoulder is essentially a ball-and-socket joint arrangement. It is made up of structures including the ball of the joint, or humeral head, the socket, called the glenoid, the collar bone(clavicle), and the shoulder blade (scapula). One of the interesting things here is that the glenoid (socket) is extremely shallow when compared to other ball and socket joints, such as the hip, thus making it a bit less stable of a joint. The most common causes of shoulder pain, and the most important to discuss here, include impingement syndrome,bursitis, osteoarthritis and, of course, the torn rotator cuff. 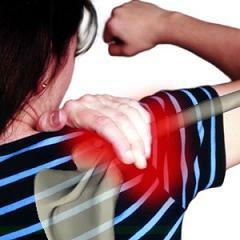 The conditions and injuries that contribute to shoulder joint pain, as were just mentioned, are responsible for significant loss of man hours in the work force, substantial Worker’s Compensation claims, loss of sports playing time, and increased difficulties with mere navigation around the home front and daily activities.